I've been using Ebates for years, almost every time I shop online. They work with lots of retailers I love, like Sephora, Target, and Old Navy, to give you rebates on your online purchases. Right now they are running a fabulous sweepstakes that you enter by sending emails from their special referral page. I'd love to refer you! If you will leave me your email address, I will send you an email with my referral link. Or if you prefer, you can just follow the hotlinks above. 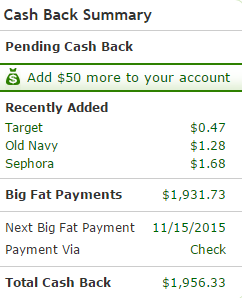 Since joining Ebates, I have received back $1956.33. In cash! How amazing is that?